I’m Jarryn Dower, an artist based in Ocean Grove, Australia who re-purposes old surfboards into artwork with detailed illustrations of surf and beach inspired themes. 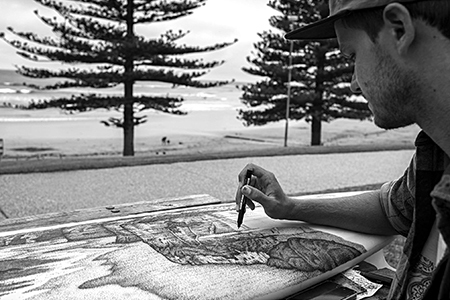 Having grown up around the Bellarine and Surf Coast, the beach and surf culture has had a large influence on my interests and lifestyle, which I’ve now translated into art. I first began this style of artwork early 2014 as a hobby between University assignments. I’ve always liked to be creative and unique with my art, so using surfboards were the perfect canvas to express myself. Every board has a story to tell of its past life through the decals, dings and fade marks. It’s great to be able to combine all of that character with its new life as a piece of artwork. A lot of work goes into each board, from the early stages of preparing the surface for drawing on, conceptualizing the design, and creating the artwork. Depending on the design and medium, the board art will usually take between 60 - 80 hours each, spanning 4 - 6 weeks. I mostly use a stippling technique with Posca Pens, creating an image out of hundreds of thousands of dots. The process is very time consuming, requiring a lot of patience, however the end result is always rewarding!